Seniors Amy Benkovich, Ariana Granda and Madison Surrency celebrate their last softball game as Bobcats. 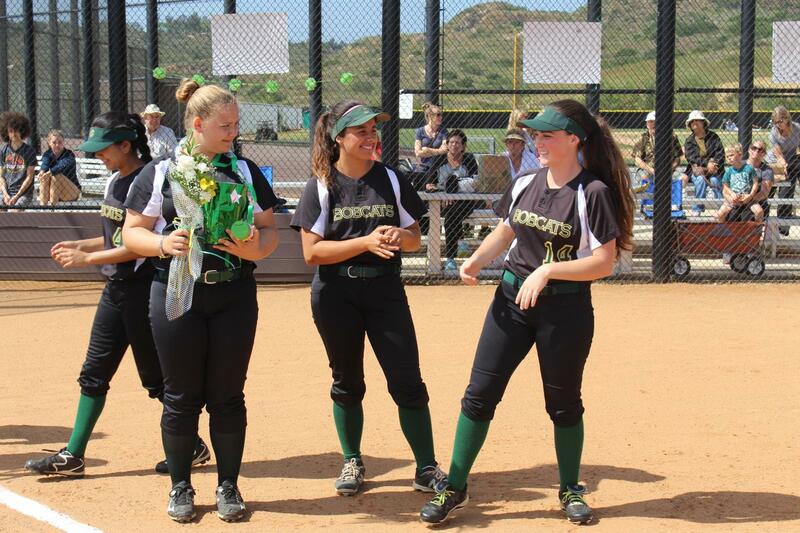 Before taking on the Carlsbad Lancers, the varsity softball team honored its seniors in a pre-game ceremony. Both the Lancers and the Bobcats sent the seniors to home plate to be honored. 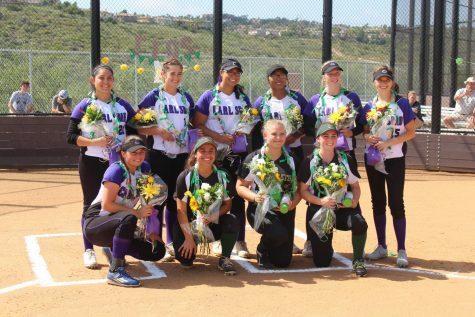 Seniors from Carlsbad and Sage Creek gather together to celebrate their senior year on the softball field. 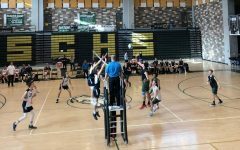 “I like how much effort the girls have put into everything- even though [Carlsbad] is [division] I and we are [division] IV. 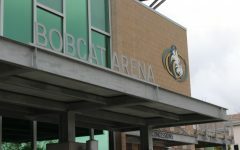 It’s just cool to see how much support everybody has for each other,” freshman Cynthia Burwell said. 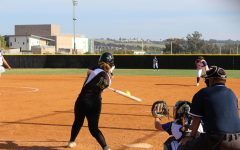 Taking on their cross town rivals proved a difficult challenge for the lady Bobcats, as Carlsbad began hammering away with a 6-0 lead in the first inning. Consecutive singles up the middle followed by rbi doubles and sac flies pushed Carlsbad out ahead early and they never slowed down. Sophomore pitcher Kendall Cliburn was hitting her spots and keeping the ball low in the strike zone, but the Lancer bats were all over her. 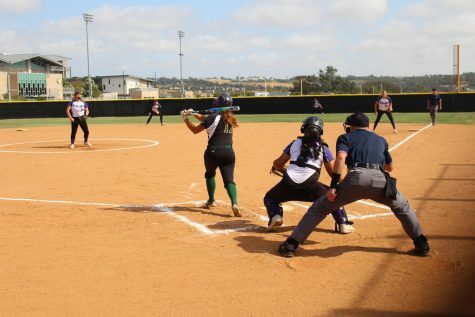 Carlsbad, in the blink of an eye, accumulated 10 runs in their first two innings at the dish. Defensively, the lady Bobcats had some terrific catches made by junior Annika Lundrigan and senior Amy Benkovich. 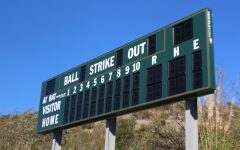 The did what they could to keep the Lancers off the board; Carlsbad just kept managing to find the gaps in the outfield and finished with 14 runs. 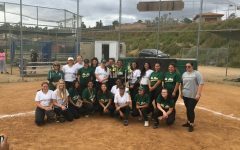 Offensively, the Bobcats were kept quiet with only three runs provided by singles from Lundrigan, senior Ariana Granda, and Cliburn. 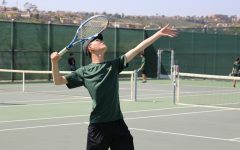 Overall, however, their five hits were not enough to deliver them a win on senior night. Despite the loss, senior night still felt “special” for Granda. “We all played together really well, communicated really well, and we left it all on the field. I’m really excited that I got to be apart of it,” she said. 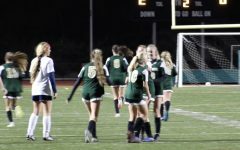 While discussing her four year journey with fellow seniors Benkovich and Madison Surrency, Granda had only the best to say about her senior and underclass teammates. Senior Ariana Granda clubs an rbi single during the team’s two-run third inning. 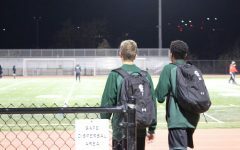 “It’s been really fun to see both of them grow as players and just to become really good friends with them. We’ve done well in leading the team and setting good examples for the rest of the girls,” Granda expressed. On top of her perspective, Burwell had more to say about how the three seniors on this year’s team have benefitted everyone as a whole. 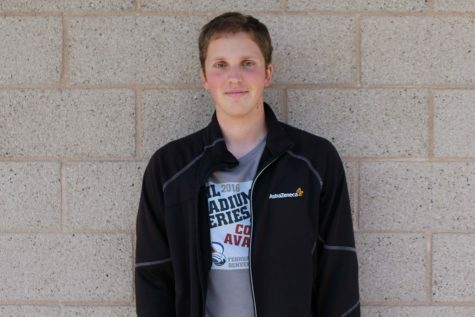 “Ari has helped me a lot with confidence, and she is just a really good team leader. Amy is so nice and her [mindset] rubs off on everybody. And Madi… I just love her to death. She has helped me as a team leader and with so much more,” Burwell said. 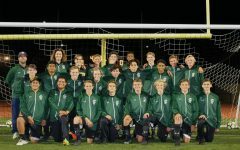 While Sage Creek may not have been able to pull out a win on senior night, they got to enjoy one last laugh with their teammates who will transition into the college world next year.